Last week I attended the funeral of Cherry Nichols, the first artist I ever interviewed, and a lady who challenged my idealistic notions of the arts from within them. 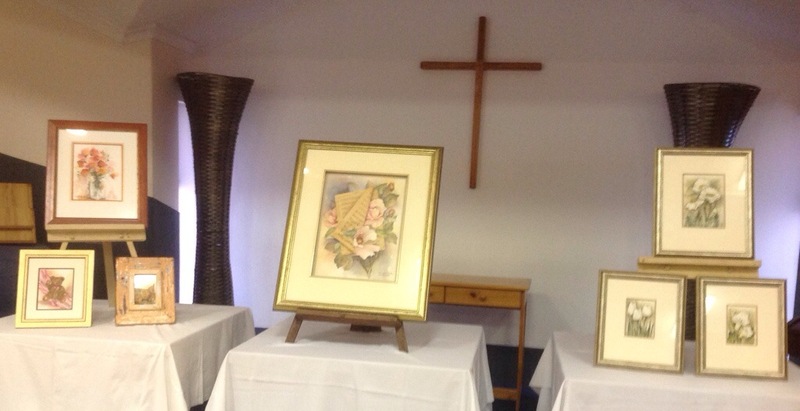 It is with sadness and respect that I here record her last exhibition of watercolours. I loved seeing the breadth of subject matter in the work she was preparing for her last exhibition. It showed hints of her relationships with her young grandchildren. The teddy bears, the fairies, even the sheet music amongst the flowers imply something of her human relationships, while she lived with her daughter and son in-law. This is comforting because I knew her primarily because of her family, and there was a time when she implied that her place in the South African art world did not afford her much room for the personal because she had mouths to feed. I remember crying over that, and I am glad she found more space to be herself later on. 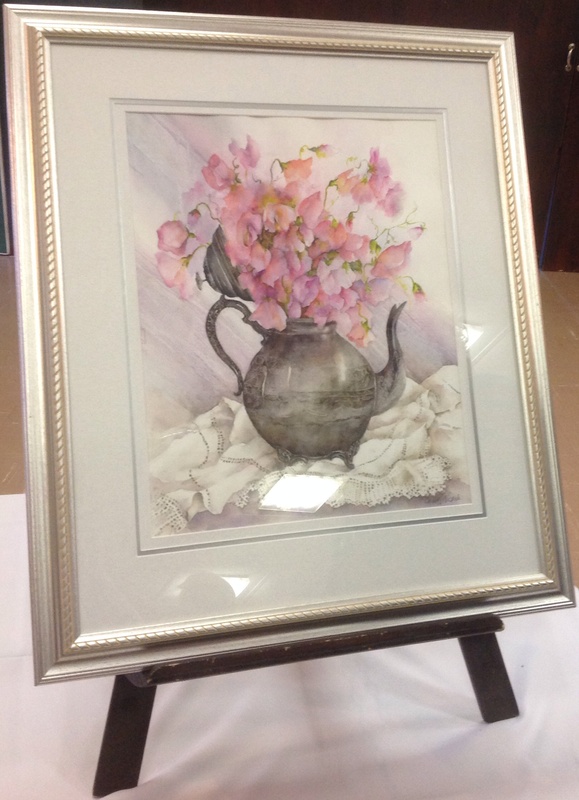 Ruth (5 1/2 yrs) loved the painting of the delicate sweat-peas contrasted against the cold, hard metal tea pot, and the intricately embroidered white cloth. For me, the ability to paint this contrast with water colour in a way that is clearly recognisable and appreciated by one so young, is a clear indication of her skill. Her choice surprised me, because it used neither Ruth’s favorite colours, nor her favourite subjects (which were present elsewhere in the exhibit), so it was the actual painting itself that spoke to her. 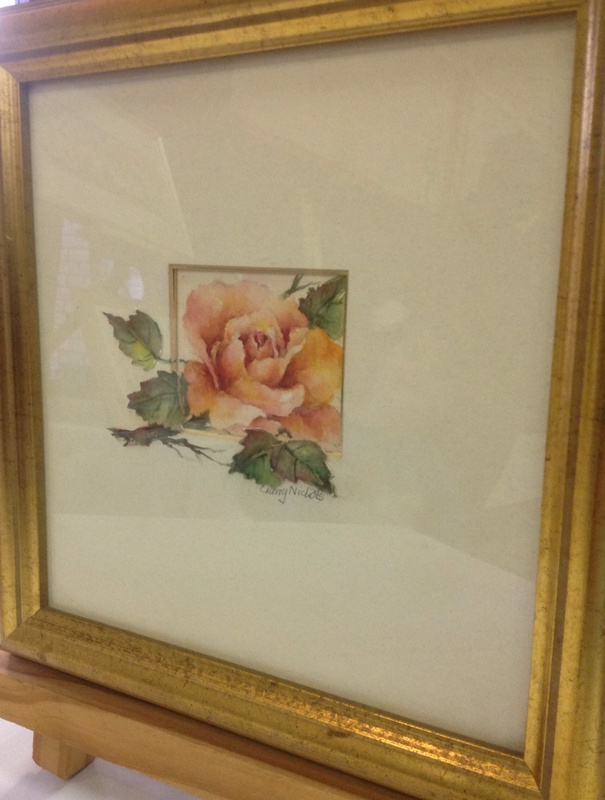 Amy (nearly 4) chose a beautiful little painting of a rose. This also surprised me because she is more of a tom-boy than a roses girl. But upon closer inspection, I realised what Amy liked about it. The rose stands alone with no apparent back ground, except that it breaks out of the confines of its mounting, sprouting leaves beyond the borders of convention. Like my little ‘rose’, it is an individual that refuses to be boxed in, and in that, its beauty is transformed and enhanced. For me, the most touching piece was the unfinished work displayed upon its board, the way I remember her always working. She once gave me one of those ‘incomplete’ works for a school project I was doing for Art theory, the first time I interviewed an Artist… Back when I was learning to think about the world behind what I saw, a world I have been unable to forget. 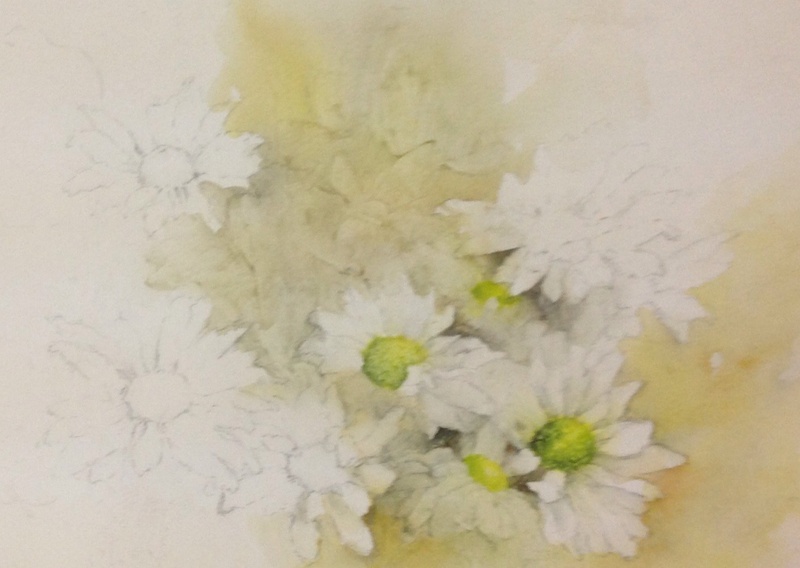 Looking at those unfinished daisies, I am saddened that it is so long since I last watched her paint, but at least she did not give up! I’m sure she made the best choice in the end. And all those of us who enjoy her work get to benefit from her struggles. Creating beauty is an act of love, because it soothes the soul of those who enjoy it. Thank you Cherry! And thank you to her family for understanding.